Now in its 38th year, the God’s Country Marathon has been named one of the “top ten toughest” marathons in the country by Runner’s World Magazine. 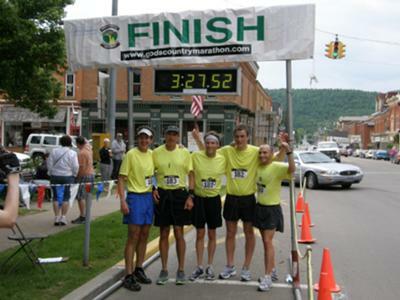 The God's Country Marathon takes runners on a scenic and challenging journey from Galeton to Coudersport, PA along Route 6 via Denton Hill. The challenge of the marathon is “conquering the hill”, which reaches an elevation of 2424 feet above sea level. The full marathon route begins at the Galeton Area School at an elevation of 1300 feet in Galeton, PA and ends at the historic Potter County Courthouse in Coudersport, PA, placing “the hill” halfway along the journey. The newly added half marathon begins at Denton Hill State Park at the base of the hill and runners “conquer the hill” in the first few miles of the race. A relay option allows teams of five to run the entire 26.2 mile course. The course is split so that each leg alternates between 5K and 10K so the distances are manageable for most runners. Runners must pay to participate, but there is no charge for spectators and supporters. Come join the festivities and cheer our amazing runners on as they "conquer the hill!" Visit www.godscountrymarathon.com or www.facebook.com/godscountrymarathon for more information. Thank you for letting us know about the 38th Annual God's Country Marathon in June, 2012.